Buy ONE Hershey’s Cookie Layer Crunch Pouch (6.3 oz. 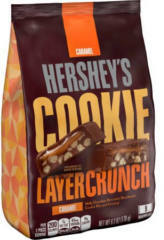 ), and get ONE Hershey’s Cookie Layer Crunch Pouch FREE (up to $3.99) with this printable coupon. Print fast because this coupon might not be around for long!